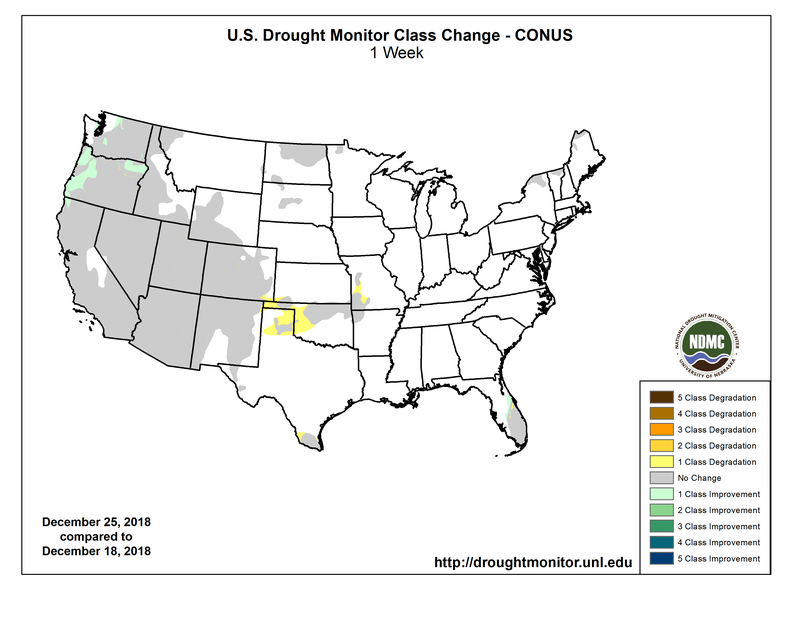 Click on a thumbnail below to view a gallery of data from the US Drought Monitor. West Drought Monitor December 25, 2018. Colorado Drought Monitor December 25, 2018. Light precipitation at best (to 0.5 inch in spots) kept dryness and drought unchanged in the northern Plains. Farther south, the dryness farther to the south and east began to encroach on Kansas, but D0 expansion was only expanded into a small section in the southwestern part of the state this week. Moisture deficits have been increasing elsewhere across the southern tier of the state, and the region will be closely monitored for the possible expansion of D0 next week. Light to moderate precipitation dampened the eastern half of Tennessee, but only light precipitation at best was measured in the western half of the state and portions of the Lower Mississippi Valley, and little or none fell farther west. The continued dryness in parts of Deep South Texas, the Texas Panhandle, and Oklahoma prompted the expansion of D0 conditions westward through Zapata County in Deep South Texas, and northeastward to cover the central and eastern Texas Panhandle, the Oklahoma Panhandle, and approximately the northwestern half of the remainder of Oklahoma. Most of these areas reported near or less than half of normal precipitation since late October, and deficits of 2 to 4 inches accumulated in north-central and northeastern Oklahoma during this period. For the CPC 6-10 day extended range outlook (January 1-5, 2019) shows enhanced chances for above-normal precipitation along the northern tier of the Plains and upper Mississippi Valley, much of New Mexico, western and southern Texas, the Southeast, and the Alaskan Panhandle. Subnormal precipitation is favored in most areas from the Rockies westward, and across the central Plains and middle Mississippi Valley. US Drought Monitor one week change map ending December 25, 2018.